I’m very excited about today, can you guess why? Taco Tuesday, of course!! And this particular taco (well, taquito in this case) I am extra excited about. Because…shrimp. I mean, I’ve always loved shrimp, no question about that, but it remains one of the proteins that I can eat in pretty much any form and still enjoy. Other meat proteins are not so high up on my list of things that are meshing well with me during this current stage of the pregnancy. It’s very odd. I don’t have an aversion to any particular food altogether, but some stuff has to be mixed with carbs for me to be able to enjoy it, versus, just a hunk of meat on my plate, no matter what glorious sauce it’s smothered in. Let me tell you folks, it’s a sad day when you make a meal you normally love, sit down and take a big ol’ bite and want nothing more to do with it. But my beloved little shrimps have yet to let me down, and this mama-to-be is very thankful for that! 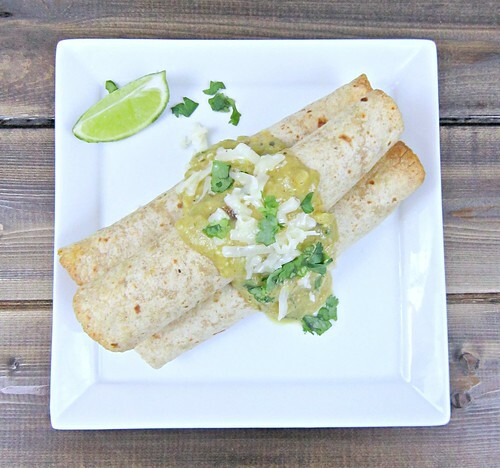 Granted, I’ve probably only eaten them in carby dishes, like pasta and these taquitos, but I devour them. And of course it doesn’t hurt when they are mixed with lime zest and yummy spices, amiright?? I’m telling you folks, this little tater baking away inside of me loves her some carbs, just like her mommy. It’s funny actually, because I wouldn’t say that I’ve had any real “cravings” like I hear about people having. You know the ones…where it’s midnight and the pregnant wife has an insane craving for watermelon, which isn’t in season, but she sends her husband out into the night to find her some or she might just die? Yeah, I haven’t had any of those. But I have undoubtedly noticed a change in what foods are good to me, right now. What foods I seem to have an aversion to and what foods I can eat no matter what. Carby things, shrimp, yogurt, salad, chocolate, spicy food and fruit. Those are things I can always count on to taste good. Other things are hit and miss. 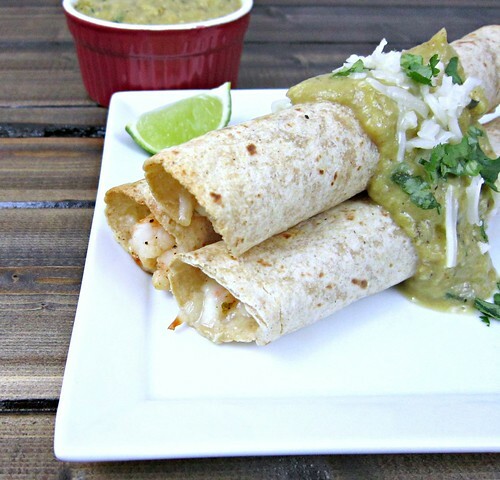 It’s no secret that I love all things wrapped in tortillas, so chili lime shrimp and cheese wrapped in tortillas and then smothered in an avocado salsa verde is really a no-brainer. I mean, hello! Have you met me? Do you know me at all??? This is heaven on a plate for me, especially right now. J never has and never will share in my deep love for shrimp, but he’s been a real trooper through my food and cooking aversions, that we seem to finally (hopefully) be on the upside of. And he really liked these taquitos. And the sauce. Always the sauce. You know we’re sauce freaks. 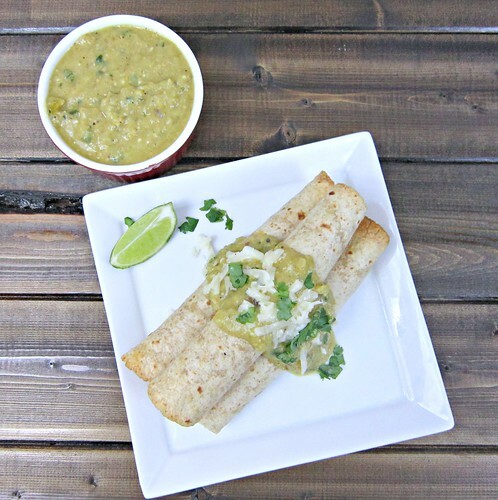 And you will be too, if you aren’t already, after you try these shrimp taquitos and avocado salsa verde sauce. They’re a match made in heaven! Preheat your broiler, on high. Line a baking sheet with foil, and place the tomatillos, cut-side down, and the jalapeno (still whole) on top. Broil for about 5 minutes, then check on them. Turn the jalapeno so it gets blistered on all sides. Once the tomatillos and jalapeno are nice and charred on top, remove from the oven and place into a bowl and cover with plastic wrap. Allow to sit for about 10 minutes. Meanwhile, heat one tablespoon of olive oil in a skillet, over medium-high heat. Add the onion and cook for 3-5 minutes, until softened. Add the garlic, salt, pepper, chili powder, and cumin and cook for another minute. Remove from heat and place the onion mixture in a food processor or blender. Remove the tomatillos from the bowl and place into the food processor (do not peel), then cut the stem off the jalapeno and place in the food processor as well, along with any liquid that may have accumulated in the bowl. Pulse a few times until the mixture is chunky. Add in the cilantro, avocado and lime juice and continue to pulse until you have a mostly smooth consistency, with just enough chunks to give it texture. Pour into a bowl (or bowls) and set aside until ready to use. To make the taquitos, preheat oven to 350 degrees F, line a large baking sheet with foil, spray with cooking spray, and set aside. Place a tablespoon of olive oil in a skillet (I used the same skillet as I did for the salsa fixins) and heat over medium-high heat. 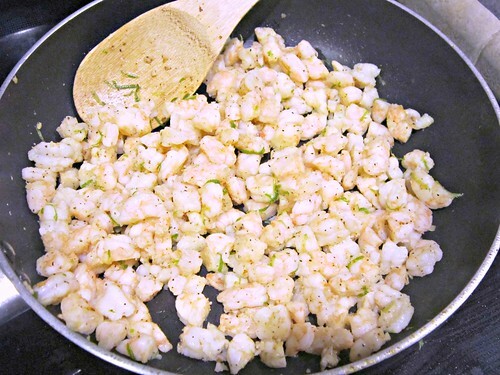 Add the shrimp and cook 1-2 minutes on each side or until the shrimp have turned bright pink. Remove shrimp to a cutting board and allow to cool slightly. Once cooled, chop into ¼” bite-size pieces and return to the pan. Add garlic, lime zest, chili powder, salt and pepper and stir to combine, cooking for about one minute over medium heat until garlic is softened. Remove from heat. 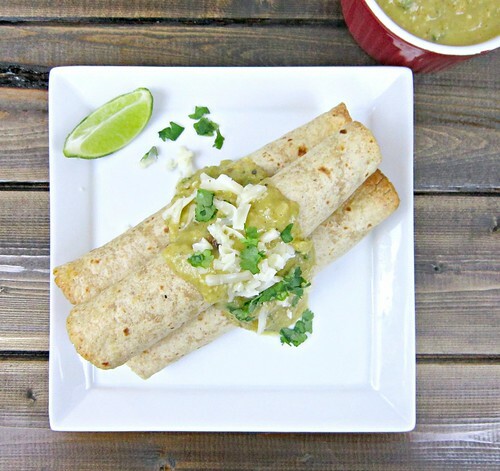 Serve with avocado salsa verde, either spooned over the top with extra cheese and cilantro sprinkled on top, or on the side for dipping!